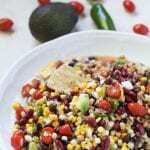 Think Texas caviar…but better! 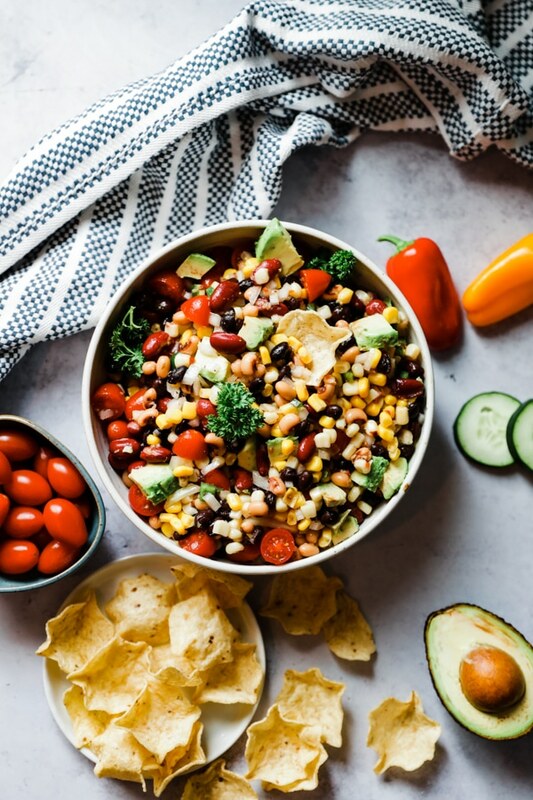 This Vegetarian Bean Dip is a crowd pleaser! If you want a new homemade bean dip for your family and friends…this is it. It is simple, healthy, and delicious too! I recommend to buy the low-sodium cans of beans (and make sure to rinse them nicely). Or, if you have extra time on your hands you can purchase the bagged beans and cook them prior. I originally got this recipe from my Aunt and I loved it and had to tweak it to make it my own. I make it for get togethers quite often and it is always a hit! You can serve it with sliced cucumbers, chips, or just eat it how it is. Hope you all are having a GREAT weekend and enjoy this bean dip! The dip you must make for parties or gatherings - it's a fan favorite! Rinse and strain beans and corn. Combine in large serving bowl. Add diced tomato, onion, jalapeños, and avocado. Add in salad dressing and seasonings. Refrigerate overnight to get the best flavor. Enjoy with chips or veggies. Check out the video I made for this too! This is so yummy looking. It is reminding me of a cross between succotash and Texas caviar. Whatever you call it I would love a scoop of it right now. This looks delicious! I make a similar recipe but I love the spices you’ve added to this. Pinning! I’d just eat this by the bowl! Sounds so refreshing! A nice change for this dreary weather we’re having here in NH. This looks so delish and perfect for summer! Loved your video on it, too!